Are you looking to buy a new propane tank? 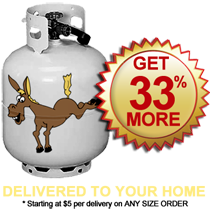 with Jack Gas you can pay 10 cents less per pound on your propane tank purchase and you get a completely full propane tank, delivered to your home or office for $24.99 only. Why go to a store and pay more for a propane tank with less propane gas in it? Ordering a tank of propane gas from Jack Gas is safe, easy and you get more propane for your buck.